This article examines the history of Mennonite pacifism in Oregon during the period of the First and Second World Wars, and explores the difficulties faced by Mennonites who felt pressure from both their nonresistant heritage and what was promoted as the national interest. Peterson del Mar, David. 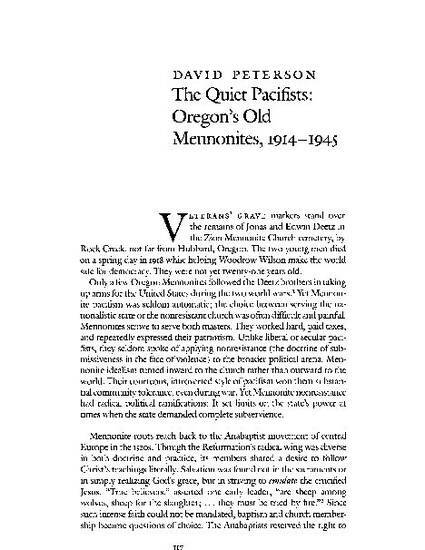 "The Quiet Pacifists: Oregon's Old Mennonites, 1914-1945." Oregon Historical Quarterly 93, no. 2 (1992): 117-146.